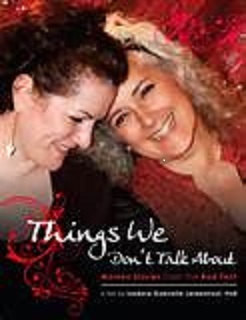 I’m extremely honored to be co-hosting Things We Don’t Talk About: Women’s Stories from the Red Tent with the award-winning filmmaker, Dr. Isadora Gabrielle Leidenfrost in October. I’ve seen this ground-breaking film several times and cannot wait to share it with both the women & men in my community. I’m thrilled that men are welcome to the screening, not just because they’ve been curious about what goes on inside the tent but also because they have mothers, sisters, daughters, girlfriends, and wives. What impacts women impacts men and they need to be welcomed in the conversation about how we nourish each other and care for ourselves in a sacred space. Though they cannot stay for the Red Tent celebration after the screening, the men will get a picture of what women do once the flap closes and we are sitting in sisterhood. Briefly put, the Red Tent movement allows women a safe place to share their stories, nurture themselves, hear the wisdom of others, & honor the divine within. While I’ve written about the Red Tent movement & my role in it before, this screening with Dr. Leidenfrost takes it to a whole new level. May women and men find the experience profoundly moving and inspirational! This entry was posted in A Window on Life, It's All Connected: Spiritual Musings and tagged health, inspiration, Isadora Gabrielle Leidenfrost, life, men, movies, Red Tent, self-awareness, spirituality, women by puresusan. Bookmark the permalink.